If you can handle turning on the oven in the middle of summer, it’s nice to bake with berries. These little golden Cornmeal and Berry Cakes, made with olive oil, are a lovely addition to my standard repertoire. And they’re easy to make, too. The recipe calls for raspberries, but blueberries would be great and blackberries may be even better. I actually used red currants, since I had a pint that I didn’t really have any other plans for. They give a tart little pop to the cakes, so I definitely wanted to add a little powdered sugar and lemon juice glaze to their tops. These can be made as mini loaves or cupcakes…I used a friand tin bought when we lived in Sydney because I like the oval shape. 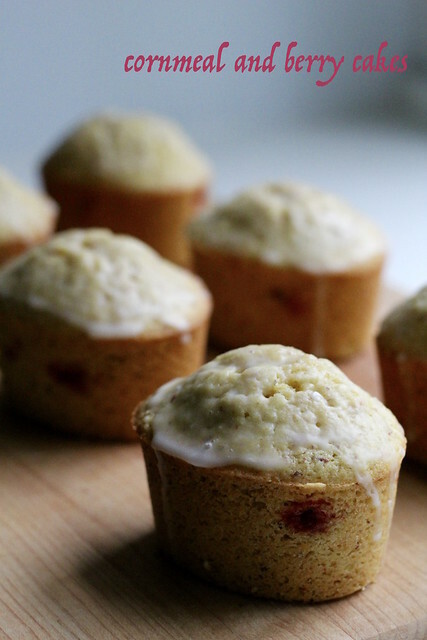 These don’t make me think of cornbread or corn muffins…they are really cakes. I think actually they’ll make good breakfast treats with coffee, and that’s how we’ll have the ones I’ve wrapped for the freezer. Love the shape! Living on the West Coast of the US I’ve never even seen a fresh currant but based on the jam I’ve tasted it sounds great. These would be perfect brunch cakes with coffee! So pretty! These were so delicious, and I agree that they are perfect for breakfast or tea. Your cakes are so pretty! I love your use of red currants — it must have tasted extra good! I really liked these too. Nice that they work with currants, I used blueberries.